Extra Wide Warehouse Steps Archives - Shelving & Racking Ltd. 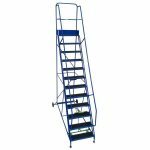 Extra wide heavy duty warehouse mobile safety steps. The same high spec as our standard mobile safety steps but with a width of 700mm enabling picking of awkward or larger items. Price includes FREE DELIVERY to most UK mainland postcodes, surcharges may apply for some areas of Devon/Cornwall, Scotland and Wales. Available in Signal Blue or Traffic Red.